Improve health care for women, children and families affected by HIV. The FXB Center, together with partner organizations, developed a toolkit that brings together a range of resources about meeting the special reproductive health and healthcare needs of people living with HIV. Click here to view resources. Elimination of Mother-to-Child Transmission of HIV in the U.S. 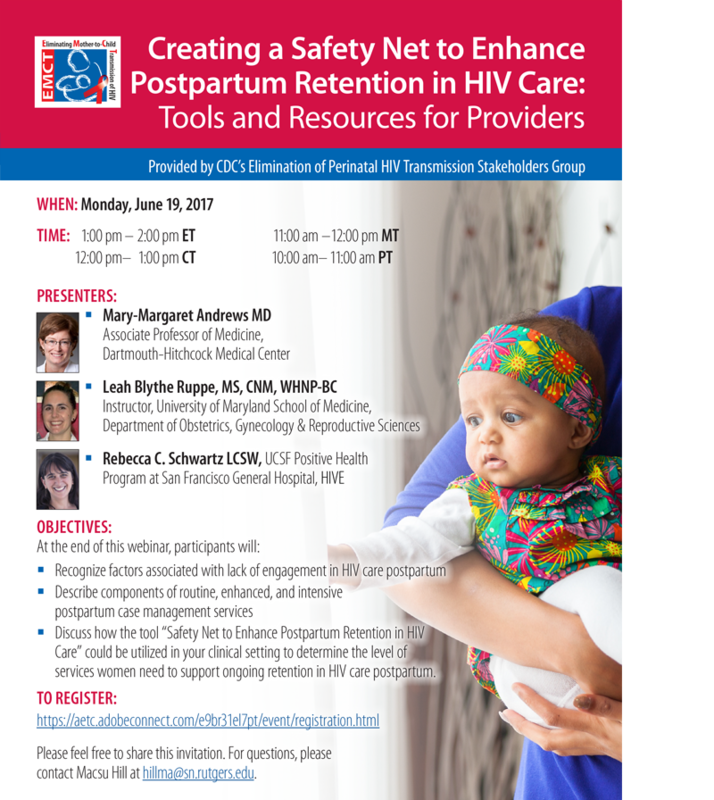 This webinar is provided FREE by the CDC's Elimination of Perinatal HIV Transmission Stakeholders Group. To view this previously recorded webinar click here. In order to receive continuing education (CE) for SC2817-081618 - Is It Safe? Safety Surveillance through the Antiretroviral Pregnancy Registry - August 16, 2018 (Webcast), please visit TCEO and follow these 9 Simple Steps before September 17, 2018. The Course Access Code is APR2018. To access the webinar recording, click here. To access the webinar slides, click here. What's New in the 2016 Perinatal HIV Treatment Guidelines? Webinar provided by the CDC's Elimination of Perinatal HIV Transmission Stakeholders Group. Slides are available here.